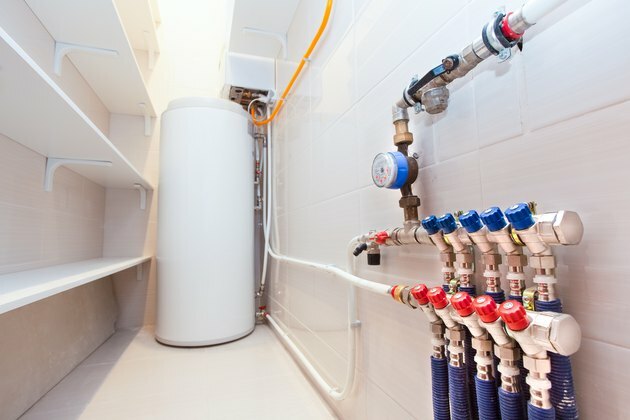 Though the systems are designed to run without an open connection to the water main, closed water heating systems may need to be flushed and refilled on occasion in order to ensure that they heat your home properly, efficiently and safely. Although it is recommended that conventional water boilers, which are connected directly to the water main, be flushed annually as part of their proper maintenance, closed boiler systems typically contain treated water. As a result, these systems should only be flushed when problems in their operations are encountered. Luckily, whether your closed system involves radiators or radiant baseboard heating, it's a simple process to drain and refill the boiler. There are distinct differences between conventional boiler systems and closed hot water boiler systems. Conventional water heating systems are often found in homes with forced air heating and air conditioning that only use the boiler to maintain a hot water supply. They have an open connection to the water main and draw from it when your home needs more hot water. Closed systems, on the other hand, are generally used for heating the home in tandem with older radiators or newer baseboard radiant heat systems. They use a supply of treated water – sometimes mixed with antifreeze – that stays in the system, circulating as necessary. These systems are connected to the water main, but the connection is usually closed and only opened to refill the system after maintenance with water that must be treated after it enters. If your closed water heating system seems to be having issues, such as a loud banging noise during operation or if the radiators or radiant heating seem dramatically slower than usual, it may be necessary to flush the system entirely. Doing so is an easy task, but before you begin, be sure to turn off the boiler's power supply. If your boiler is gas powered, turn the thermostat to the "pilot" setting. Wait a few hours for the water in the system to cool enough to be drained safely. Once the boiler is off and the water inside has cooled, locate the boiler's drain faucet somewhere along the bottom of the unit. Connect the drain to a garden hose by screwing it on tightly, removing a drain cap from the faucet if present. Then, place the open end of the hose either inside a utility sink, by a nearby floor drain or in a location outside where it is safe to drain the water and where the discarded water will flow downhill. Returning to your boiler, lift the relief valve lever to allow air into the system, which will speed up the drainage process. Open the drain valve slowly so that water gradually begins to drain from the system, then wait for your boiler to drain completely. If you use radiators, open the bleed valves on the highest placed radiators in your home when you can no longer hear water exiting the boiler. Allow water to drain from them, then open the valve on the radiator nearest to the boiler. When the sound of flowing water stops, your system can be refilled. Once water has finished draining from your system, shut the drain valve and store the garden hose. Close the bleed valves on your radiators if you have them, then open the water inlet valve on the boiler and allow the system time to refill. If your boiler has an automatic shut-off, it will stop filling on its own. If not, be sure to shut the inlet valve when the boiler's pressure reading reaches its recommended threshold. Open the bleed valve on the highest radiator in the home to vent any excess air from the system. If you have an expansion tank installed, this process should essentially be automated. You may now treat the water in your system as necessary, restore power to the boiler, and enjoy your freshly flushed heating system. What Is a Locked Open Ball Valve?